More than 200 travel agents turned out for the SkyLink 2018 Roadshow last night at the Holiday Inn Yorkdale in Toronto. Baxter Media was in attendance with magazines, print directories, candy, luggage sashes and photo ops for agents in front of the green screen. A buzzing and energetic trade show was followed by presentations and dinner. The event completed a series of six Skylink Roadshows for spring 2018. 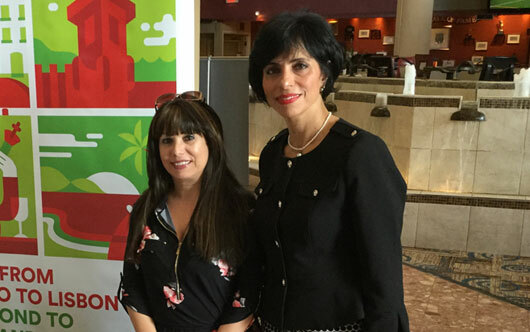 Pictured are Lillian Vieira, district sales manager – Canada for TAP Air Portugal, and Eman Alqeram, sales manager – East Canada for Skylink Canada.